i've been waiting for this announcement since before the season even ended. 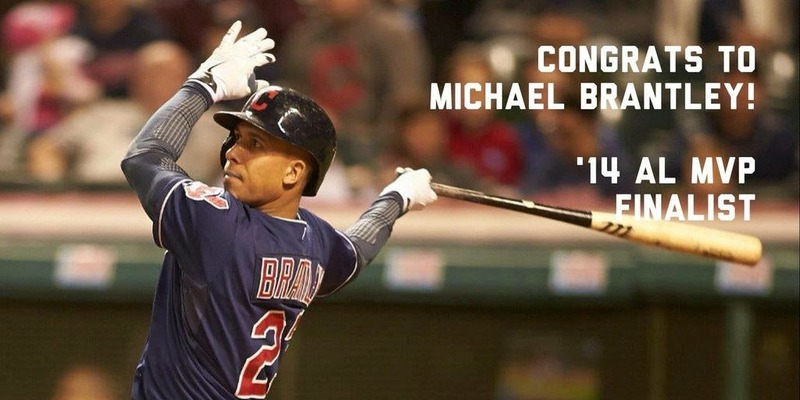 this evening, on November 4, it was revealed that the Baseball Writers' Association of America named Michael Brantley as one of three finalists for the 2014 American League Most Valuable Player Award! this MVP nod is the first of his career! he's nominated along with Mike Trout of the Angels and Victor Martinez of the Tigers. congratulations! if you're unsure how MVP candidates are chosen, let me provide a brief explanation. two writers from each American League city vote for AL MVP, totaling 30 votes overall. there are 10 spots on the MVP ballot and the finalists are the players who finished in the top 3. all players, including designated hitters and pitchers, may be chosen for most valuable player. writers of the BBWAA submit their picks before the postseason begins. each spot on the ballot equals a certain number of points. a 1st place MVP vote is worth 14 points. the rest of the ballot spots are worth 9-8-7-6-5-4-3-2-1 points from 2nd place down to 10th. BBWAA's secretary/treasurer, Jack O'Connell, tallies the votes before the finalists are revealed in November. the full results will be posted on the BBWAA website after the winner is announced. as a general rule of thumb, writers define the MVP in terms of 1. the value a player has to his team, offensively and defensively, 2. the number of games he played, and 3. the player's general character, disposition, loyalty, and effort. everything minus the walks and strikeouts was a career high for him this season. Michael also led the American League with his .376 BA with RISP, .346 BA with runners on base, and .337 BA against right-handed pitchers. no Tribe player has been named MVP since 1953 when Al Rosen won the award. before him, Lou Boudreau won it in 1948 and George Burns was MVP in 1926. and that's it. only those 3 players have won MVP in the history of the Indians. if Cleveland fans had their way, Michael would be the 4th. during Michael's final game of the season on September 27, fans started "M-V-P!" chants every time he came to the plate. when the media told Michael about this after the game, he was humbled and appreciative. "that's a remarkable feeling. i want to thank the fans for that. it's not something you hear very often. it's not something that's just thrown around. my hat's off to them. i can't thank them enough."